About 1,500 Seventh-day Adventist women from ten different regions of Cameroon recently met for fellowship, prayer, and praise. From far and near, women traveled to the Place du Cinquantenaire venue in Ngaoundéré, the head city of the Adamawa region, in central-northern Cameroon, for the Second National Adventist Women Ministries Congress, from April 2 to 8, 2018. 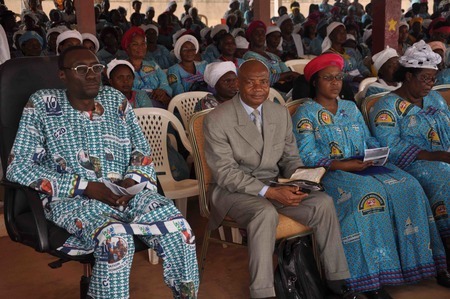 Cameroon Union church region president Valère Assembe and West-Africa Division (WAD) Women Ministries director Obomonike Sessou were also present at the event, as well as local and regional government officers. In his address to the crowd, one of the government representatives invited commented how much he enjoyed being present at the Adventist women’s event. “I marvel to see such a gathering and commitment from women of various ages,” he said. Just a couple of hours before, he had witnessed how, as part of the opening program, Adventist women had walked through the major streets of the 200,000-population city giving away books and leaflets. Attendees and organizers agree that the most important feature of the event was prayer. Much prayer. Nathal Wandji, one of the participants, reported that women who shared her dormitory would wake up at 3 a.m. and pray until 4.00. That spiritual exercise was the cornerstone of the congress, attendees said. The event theme, “Women for Christ, Light of the World, Be Lighted Up!” was not just a slogan but a reality, said organizers, as women shone all over the city. They could be seen everywhere, and the city took notice. Adventist women carried out humanitarian activities through assistance to specific people groups in need, including the elderly. They also received training and shared powerful testimonies of healing and restoration. During the event, a graduation ceremony was held for the women who completed leadership training programs. 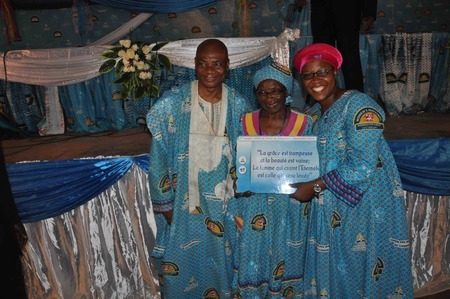 Sessou congratulated the women as she handed them certificates and praised them for their efforts. “You showed that you deserve these certificates,” she said. The congress concluded on Saturday, April 7. The previous day the 1,500 attendees enjoyed a special Lord’s Supper service. 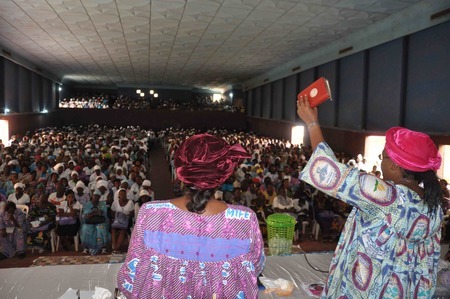 Participants left the venue spiritually energized and ready for the next meetings — the WAD-wide Women’s Ministries congress in Ghana in 2019, and the next national event in Cameroon in 2021. In his farewell address, Assembe pleaded with the women not to let their lights die out. “Take care lest your light could turn into darkness!” he told them. Sessou left them words of encouragement and an invitation. “Keep shining for Jesus!” she said.